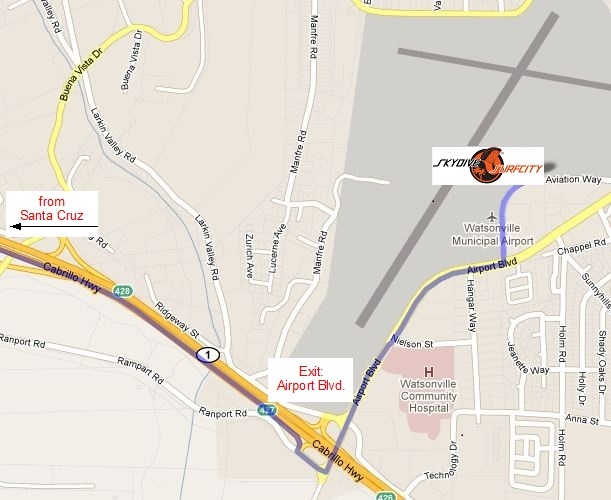 The airport is located around 1.5 hours South of SF in beautiful Santa Cruz County. Why Santa Cruz? There is no skydiving allowed within the city of San Francisco due to airspace restrictions. All Skydiving centers in the BAY AREA are around 1-2 hours outside of San Francisco. Skydive SF is working with Skydive Surfcity, the closest Skydiving Center to San Francisco and San Jose,boasting THE most spectacular coastal views! We are right in the center of the amazing Monterey Bay. There is no Drop Zone with better coastal views-period! From San Francisco and Santa Rosa you want to drive SOUTH. Depending on where in the City you are, take 101, 280 or 880 South toward San Jose. From San Jose: Merge onto CA-17 South toward Santa Cruz. Exit at the Airport Blvd. off ramp. Turn left onto Airport Blvd. Turn left, onto Aviation Way. We will be on left hand side.